The WiLab is the user-friendly and powerful solution of CMA for measuring with tablets and Chromebook. With the WiLab you can do the same quality measurements as you are used to with our other interfaces. And with your current sensors, which do not need a battery, and are simply fed from the WiLab. Even if you want to measure with 2 sensors, the measurement will be accurate, without limits on the measuring frequency. Thanks to optimized data communication, especially when you can work with BTLE 5, you have the graphs in real-time at a higher measuring frequency. 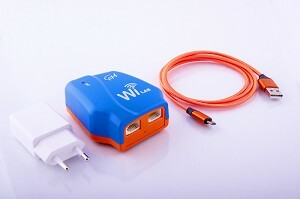 The WiLab can also communicate via the latest protocol BTLE 5, with the devices that are suitable for this. This means even faster communication, and also over longer distances. WiLab is supported starting from the Coach 7.5 Lite (free) and Coach 7.5 (licence) programs for computers and Coach 7.3 Lite (free) and Coach 7.3 (license) Apps for tablets.